Geary Boulevard corridor looking west from Laguna, August 1961. 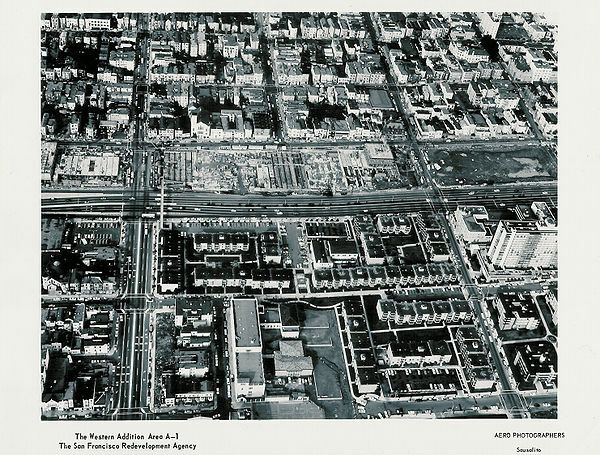 In the early to mid 1950s, A-1 began with families and businesses being removed by eminent domain, and the properties being completely bulldozed. 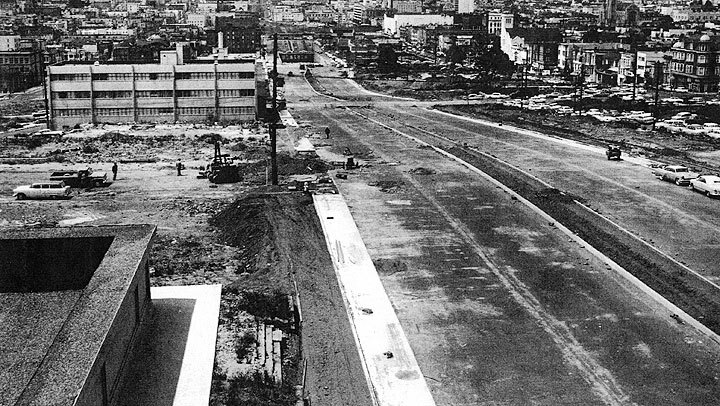 The first action in the heart of the demolition area was to widen of Geary St. to an eight lane expressway to move traffic through the Fillmore into the Richmond District with tunnels under Fillmore St. and Presidio/Masonic. The dislocated families and businesses were scattered with no foreseeable ability to return for the cleared land lay fallow for several years. 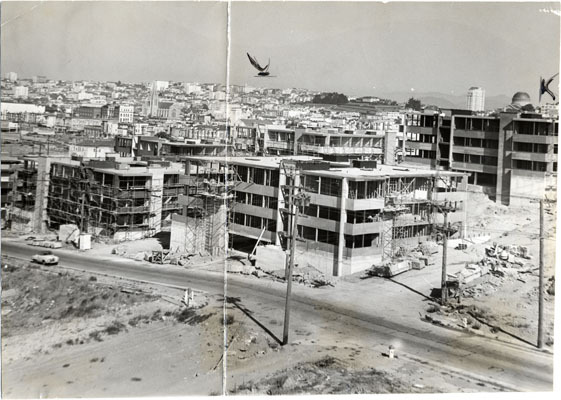 The first plans for rebuilding were high-rise luxury apartments—Cathedral Hill Tower and Plaza, the Carrilon Tower, the Eichler’s, the Sequoias, and St. Mary’s Cathedral crowning the top—all upscale apartments located on the newly-named “Cathedral Hill.” In 1960, Redevelopment set aside three blocks for affordable garden apartments. This would eventually become St. Francis Square Cooperative. The Square was sponsored by the ILWU-PMA Pension Fund (ILWU is the International Longshore and Warehouse Union; PMA is Pacific Maritime Association, made up of representatives of shipowners and stevedore companies and is the body which negotiates contracts with the unions of longshore and seagoing unions). Lou Goldblatt, ILWU Int’l Secretary-Treasurer played the key role. I wondered how Goldblatt came to conceive of this idea—how did this Union leader’s interest in housing come about? 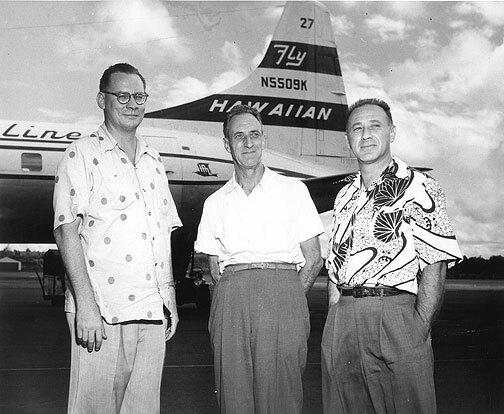 Jack Hack, Harry Bridges, and Lou Goldblatt, 1951. I checked Lou Goldblatt’s oral history, which had a few pages on the subject. To quote: “I happened to get the idea that there was no reason why the pension funds (which had been negotiated in 1950 and were accumulating a great amount of money) should just be laying around being invested in high grade securities. I thought there was no reason why that money shouldn’t be used to build some low-cost housing. I knew a little about what I was trying to do, because my brother had been a builder for years. In conversation with him, I picked up how much money was taken off the top before a house was sold; between the interim financing, the advertising, the amount of profit, altogether there was at least 20% that went off the top, leaving aside profit to the guy who was doing the building. This was all money that could be saved. 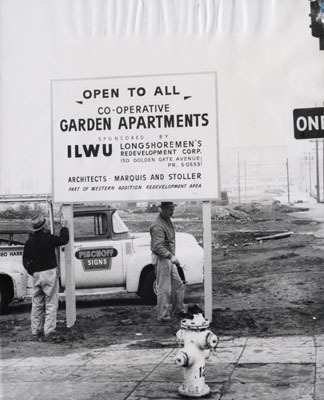 The ILWU-PMA Trustees formed the ILWU Longshore Redevelopment Corporation which put together a proposal to the Redevelopment Agency along with expertise of Hal Dunleavy who headed a real estate research company and Claude Stoller, an architect with Marquis & Stoller. The proposal was put before the ILWU-PMA Trustees in May 1960, and to the Western Addition Redevelopment Project in June 1960. Documents I’ve collected also include the approval of the proposal and sale of the land to the ILWU Longshore Redevelopment Corporation. St. Francis cooperative apartments advertising sign in 1961, before construction begins. Construction began in 1962 and was completed near end of 1963. It was an unusual project, in that the final cost to the families who would buy homes in the co-op, determined the limits of its overall construction cost. The original plans came in $1M over budget, and the contractor and architect had to make changes necessary to remain “affordable.” It had to be altered to reduce the final cost so that the down payment (the cost of a co-op share) would be $410 for a one-bedroom unit to $610 for a 3-bedroom unit, and the monthly payment would be $84 to $140 which would include mortgage payment, utilities, insurance, taxes, and reserves for repairs and maintenance. The famous architect Joseph Eichler built 6 3-story buildings (12 apartments to each building), five of which became co-ops called Laguna Heights Cooperative; The sixth voted to be a condo. Seen here under construction, August 18, 1962.